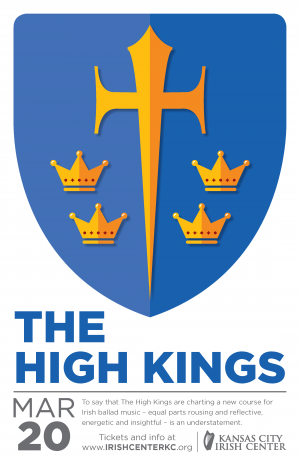 We are so excited to welcome The High Kings back to the KC Irish Center for a second consecutive year! To say that The High Kings are charting a new course for Irish ballad music – equal parts rousing and reflective, energetic and insightful – is an understatement. They are, essentially, marking out a new and bright era for Irish folk music, and bringing a broad demographic along for the journey. The band’s energetic concerts showcase their incredible versatility and skills as multi-instrumentalists, playing 13 instruments between them bringing a rousing acoustic flavour to brand new songs as well as some old favourites. The High Kings are continuing to live up to their reputation as a phenomenal live band, serving up laughter, good times and even the odd sing-along! $60 – VIP includes early admission, preferential seating and a pre-show meet-and-greet. Only 40 VIP tickets will be sold. Last year’s concert at the Center was a sell-out, and we anticipate the same this time, so don’t delay in making your ticket purchase!! We are once again offering two ticket options – VIP ticket, which includes early admission, preferential seating and pre-show meet-and-greet, as well as a General Admission ticket. NOTE: General admission ticket price will increase to $35 at the door.